In December of 2016, Patriot Plaza Guides welcomed forty-six fifth-grade students and their teachers from Imagine School Palmer Ranch to a tour of Patriot Plaza. 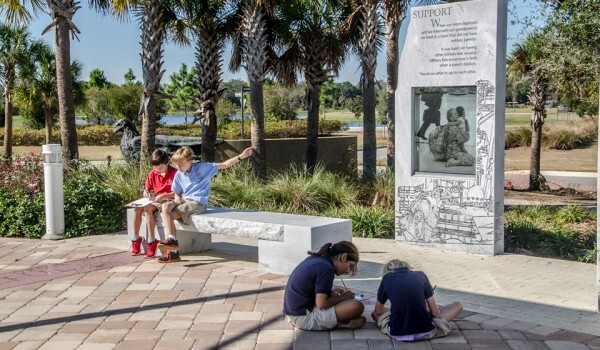 Patriot Plaza and EdExploreSRQ— two initiatives of The Patterson Foundation—“cross-pollinate” to inspire students and their teachers with experiential learning. This off-campus destination is the perfect venue for exploring American values while also utilizing lesson plans which help inspire and teach students before, during, and after the exploration. Student tours focus on the themes of Patriot Plaza which honor Veterans, inspire patriotism and embrace freedom. For students in Grades 4-6, learning at Patriot Plaza is aligned with standards in the subjects of English Language Arts and Visual Art. Students learn what a national cemetery is, who is buried there, and about five large outdoor public artworks. Another bonus! The Patterson Foundation underwrites transportation for all Patriot Plaza Explorations. Fifth Grade student Michael Trynor wrote: The trip to Patriot Plaza was amazing! I loved every single second of the trip, so much my jaw dropped! I think the trip was incredibly educational and amusing. I loved all the sculptures, paintings, and especially all the tablets with heartwarming quotes. Personally, my favorite was the star projection map. It gave so much detail on the map, even where you were at the exact moment if you’re at Patriot Plaza. One thing I learned at Patriot Plaza is that it’s not a memorial and honors the living and dead. I also learned about the back story of each and every one of the tablets. Visiting Patriot Plaza had to be one of the best trips ever if not the best. I know it will be a treasured memory for me forever! Five Patriot Plaza Guides greeted these students and helped to explain the meaning of the different works of art. They described the students as polite, interested, and enthusiastic. During the tour, the Guides spoke about their own military service or support of someone that served. To become a Patriot Plaza Guide, you must invest several months in learning the tour information and presentation skills. Kudos to our lead guide, Deb Tishman, and tour guides Mike Loparco, Charlie Schwall, Ed Gates, and Jimmy Ellison. We are most grateful to teacher Alexis Pitsch from Imagine School Palmer Ranch who made the arrangements for the students to visit Patriot Plaza to learn and hopefully be inspired. We thank her and her students for participating in this post, and appreciate their enthusiasm for Patriot Plaza!